Diving into the unknown, one group of hard-working seniors continues to blaze their own trail, hitting milestones at every step. 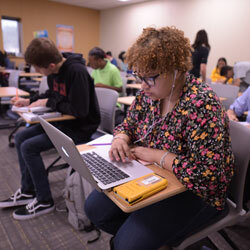 A little over three years ago, the Killeen Independent School District opened the Early College High School in coordination with Central Texas College and Texas A&M University Central Texas. In anticipation, Kathleen Burke, the school’s first and only principal, visited every middle school in the district explaining the new concept to students and parents. Once the first group of 150 ninth-graders committed to the school, she often thanked them for joining her on this ride. Stealing a moment on this year’s first day of school August 27, Burke wondered at how time flies. It’s like that for this year’s first-ever senior class, too - the ECHS Lions Class of 2019. There are 171 of them and they are ready for whatever comes next. Senior Tess Conrad was among a group of student leaders guiding incoming freshmen the week before school started. She pointed out that her class would be in a different building this year – not really a big deal since they have changed every year. As freshmen they occupied a hallway in the CTC nursing building. As sophomores they moved to a repurposed KISD middle school on Fort Hood. Last year, as juniors, they were mainly in the newly-named Shoemaker Building. Now, they are next door in Eagle Hall. It hardly matters anymore since these seniors have proved themselves on a college campus. Half their courses this year are CTC courses. They have learned to adapt. Looking back on the unusual high school experience while gazing ahead to graduation, Conrad praised the school staff members, both the KISD faculty and the CTC professors and other staff. Part of that support came from academic offerings like AVID, which specifically helps students with skills like notetaking and studying as well as applying for college admission and scholarships. 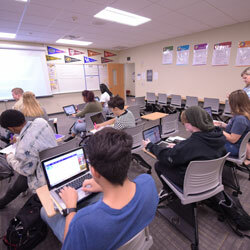 Early College also provides a unique course called PATH that shifts its focus each year based on specific academic needs. This year, PATH mirrors College Algebra for seniors and English for younger students. Constant support from CTC has been huge, Burke said, pointing out the college’s commitment to keeping the high school staff informed and the high school students engaged in college life. During an overlapping week prior to the start of the semester last January, CTC provided high school students enrichment sessions. The ECHS students take part in a variety of clubs and organizations, including CTC intramural sports. Students vote on many aspects of student life. 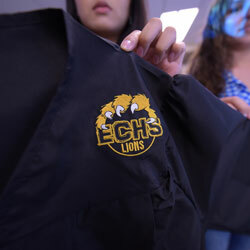 They chose their Lion mascot and black and gold colors, as well as their own electives. This year, seniors chose early release, visual arts, yearbook and Pre-Calculus. Before they move on, there’s the matter of building senior traditions for years to come. The seniors met recently and cheered at the sight of the gown they will wear during graduation. It includes the Early College Lions logo. Assistant Principal Kayren McCarty is helping to guide the seniors in developing tradition. She is excited about the excitement bubbling up on the campus. “The excitement is the fact that they are trailblazers,” she said. “They have this unique position to build tradition that will be a platform for the future. They have a lot of ideas.” Seniors have formed committees to work on different aspects of this final year. During this homecoming season, a spirit week is planned later in the fall and of course later in the spring a series of celebrations will lead to graduation. In the case of Early College High School, there are two commencement ceremonies. 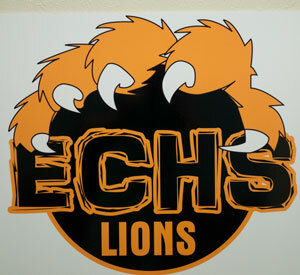 The CTC graduation is May 10 and the ECHS KISD graduation is May 31 for the Class of 2019.